Mrs. Brosseau's Binder: Angry Birds in Real Life Game! I've recently been told that I "have too much time on my hands". Well this couldn't be further from the truth! I just have too many ideas in my head and things I want to create. Who is in the same boat? You could have the entire weekend to channel your creativity and it still wouldn't be enough? This time, I didn't have the entire weekend. I had to come up with an activity for the Grade 8s who were coming to visit today. 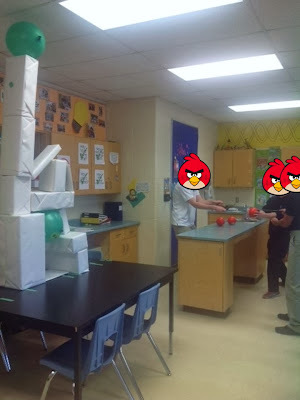 It had to be short because it was part of a race around our school So a student of mine suggested a minute to win it style game, and then I came across some videos of Angry Birds in real life. I put this all together in just a few hours and for less than $20- so you can too! I used my Silhouette Cameo (great invention or the greatest invention?) and my printer to print and cut out the faces for the 3 red birds and pigs. I used glue tape to attach their faces. I like the Recollections brand, but the dollar store glue tape I had at school worked fine for the pigs. For the slingshot, I took a piece of scrap fabric (leftover from our wedding guest quilt!) and sewed the bungee cord right into it. This honestly took the longest time. Not because it was difficult to do, but because I forget how to get the top thread to grab the bottom thread and had to find a manual online! The fabric held really well and didn't tear even with how hard the kids had to pull (the bungee cords were really strong). I wrapped the cardboard boxes in the paper roll from IKEA kids use on their easels. Someday, I'll have an excuse to buy one of those easels :) I was going to paint the edges, but felt like it wouldn't dry in time. 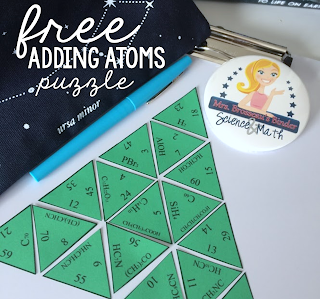 But I am going to keep those around to use when I teach Physics. So the kids worked as a team of three (one on either side of the slingshot and the third aiming and shooting) and they had a blast. We were able to move through the activity quickly and I had enough time between the groups to reset. Just be careful not to expose the pigs to head-on shots. The first bird to strike a pig head-on before the kids came in actually blew up! So we were down to two pigs for the rest of the day. It was a lot of fun exposing the Grade 8 kids to Physics and what we do in class. They seemed like they had a really fun day and are becoming less and less scared to enter high school. But the Grade 8s couldn't have all the fun! My Grade 12 students got to play after their quiz today and made some interesting "levels". The Grade 12s came up with their own "levels"
If you're thinking about trying this - go for it! It didn't take an incredible amount of time or money and made for a really fun day. Would you be willing to share this lesson with me?